PASAY CITY – Senator Chiz Escudero is seeking the inclusion of copra farmers affected by the declining prices of copra in the market as beneficiaries in the government’s conditional cash transfer program. “The Department of Agriculture (DA) and the Department of Social Welfare and Development (DSWD) should intervene. If they have the Pantawid Pamilyang Pilipino Program (4Ps) for the poor, they should also have financial aid for the copra farmers and workers who are affected by the very low price of copra in the market,” Escudero said during a visit to Tacloban City. The senator said copra farmers who are affected are not only from Eastern Visayas (Region 8) but also from the Bicol Region, where he hails from. Escudero also questioned the accuracy of the National Household Targeting System of the DSWD in distributing the conditional cash transfer. “Kasi kung accurate lang talaga ang national home targeting system ng DSWD, e di ang copra farmers and workers, dapat sa ngayon beneficiaries na sila ng Pantawid program. Ang tanong ko, lahat ba sila beneficiary niyan?,” he said. Escudero said the DSWD should ensure that all affected copra farmer households are given their 4Ps. For those who are not yet included in the program, the DA, for its part, should provide subsidy and alternative livelihood while copra’s price in the market is still low, he said. “Maraming apektado ngayon. Sana binabantayan ng Deparment of Agriculture at ng PCA iyan na kapagka mababa ang presyo, magbigay sila ng sistensya sa mga pamilya, sa mga coconut farmers dahil maraming hindi makakapag-enroll, maraming hindi makakapasok sa baba ng presyo ng kopra ngayon. At dapat nagshi-shift din sila ng assistance depende sa pandaigdigang presyo ng mga produktong umaasa ng kita ang ating mga kababayan, the senator said. Escudero also called on the DA to closely monitor the prices of copra and its effects on the copra farmers. “On a yearly basis or on the monthly basis, dapat binabantayan ng DA iyan. Dapat tinitignan ang presyo para malaman kung apektado nga ba ang partikular na grupo ng magsasaka o hindi. Para mabigyan sila ng assisstance, subsidy o alternative habang mababa ang presyo,” Escudero said. TACLOBAN CITY – The 282 farmers from all over East Visayas who graduated from the University on the Air classes on Organic Farming, are now the Department of Agriculture’s strong partners in weaving a viable organic production system. This was pronounced by DA Region 8 Regional Executive Director Antonio G. Gerundio during the Culminating Exercises of the UOA on November 28 at the Leyte Provincial Gym. The 282 farmers coming from Leyte, Samar and Eastern Samar provinces completed the season-long course and received their diploma from the DA-8 and the Leyte Provincial Agriculture Office. It was observed that there were more women farmers who participated in the University on the Air with 189 out of the 282 graduates. Said farmers spent almost five months to finish the course by listening to the radio for 30 minutes from Monday to Saturday. By doing so, they kept themselves abreast of the series of topics discussed by experts on organic agriculture from national, regional and provincial offices, Mr. Francis Rosaroso, chief of DA 8 Information Division, said. Similar to the classroom teaching method, the students, after listening and taking note of the lectures, answered short quizzes and major examinations administered by the radio program hosts. “We are doing so to determine their level of reception on the concepts and principles gained from the discussions,” Rosaroso said. The municipal/city agriculturists and agricultural technologists served as supervisors of the farmer-students. To complement the discussions, the students were required to join the educational tour to identified progressive farms in the region. All done, a panel of evaluators selected the top 10 students that were given special awards and prizes sponsored by DA-8 and the Provincial Local Government Unit of Leyte through Governor Ma. Mimietta S. Bagulaya. Mr. Ariel R. Rupa, a 44-year old farmer from Palo, Leyte was awarded as Valedictorian; Farmer Jonathan Alegro of Babatngon was Salutatorian; Farmer Pedro Banilbo of Tanauan was First Honorable Mention; Danilo S. Daylo of Palo was 2nd Honorable Mention while Danilo Daria of Tunga was 3rd Honorable Mention. All the medalists are from the Province of Leyte. Meanwhile, Ms. Faye Macapanas, info officer, said that the said occasion gathered not only farmers but also officials and technical persons from various agencies supporting the organic agriculture program such as Ms Joie Faustino from DA-OSEC, Dr. Rodolfo Estigoy from PhilMech, Dir. Paulino T. Cabahit from ATI-8, Mr. Ronelo Pisquera from PCIC-8 and several others. Moreover, Ms Emalyn Legal, a member of the National Organic Agriculture Board (NOAB) and the Mindanao Small Farmers’ Representative revealed that the present administration targets to convert at least 50% of the country’s total agricultural area into organic farms. Coinciding with the event was the awarding of this year’s Regional Gawad Saka farmer-achievers. 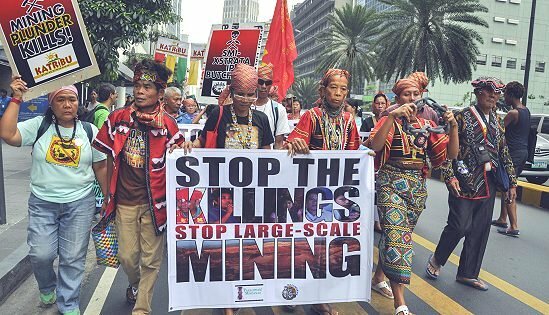 Mindanao indigenous peoples and environment groups to PNoy: scrap current mining policy to avert another Pablo ‘apocalypse’! MANILA – A group of Mindanao-based indigenous peoples and environment organizations leading a ten-day lakbayan to Metro Manila called on President Aquino to scrap the government’s standing mining policy allowing large-scale mining operations in the light of the latest disasters in Mindanao where super typhoon Pablo claimed more than two hundred lives in the provinces of Compostela Valley and Davao Oriental which have not experienced typhoons in recent years. Environment group Panalipdan! Mindanao secretary-general Sr. Stella Matutina, OSB said that hundreds of communities in Mindanao have been rendered vulnerable to natural disasters due to the proliferation of large-scale extractive industries being promoted by the Aquino administration through existing government policies and programs such as Executive Order 79 and the Mining Act of 1995. “What we are seeing now is an environmental apocalypse not simply caused by nature's wrath but by the Aquino’s continuing puppetry to foreign mining interests and the government’s greed and corruption in general. The heartbreaking disasters in the New Bataan and Cateel towns and elsewhere illustrate how Mindanao's environment has reached its maximum limit, and unless this government adopts a mining policy which puts people’s safety over the insatiable thirst for profits of large-scale mining companies, we can only expect greater destruction in communities where there are big mining activities," Matutina also said. Prominent Mindanawon environmentalist Francis Morales also pointed out the presence of the 2,139.44-hectare gold and copper mining project of the Canadian-owned Philco Mining which operates in the hinterland barangay of Camanlangan in New Bataan town. To date, typhoon Pablo has left more than 70 people dead in this sleepy town which used to boast of being typhoon-free. Morales has long sounded the alarm about the unabated mining explorations and operations in New Bataan, fearing that it will affect the integrity of various ecosystems in the area such as Mt. Kampalili-Tagub Range Complex, a known Key Biodiversity Area (KBA), and Andap and Caragan watershed areas that supply ample amount of the water for residential and agricultural uses in Compostela Valley province. He also said that despite these serious threats to the lives of the local residents, the people have not been able to voice out their opposition due to widespread military operations which, he said, ostensibly protect big extractive industries. “The ultimate objective of massive military deployments in New Bataan is to wipe out all types of people’s resistance against mining under the Investment Defense Force (IDF) and mining liberalization policy of the Aquino regime. Despite the community’s resistance, militarization has only resulted to displacement, intimidation and other string of human rights abuses in New Bataan,” Morales said. Guaynon, chairperson of the indigenous people group KALUMBAY, headed an environmental mission after the Sendong tragedy almost a year ago, which left 1,257 people dead and 13,337 houses damaged. The mission yielded a conclusion that the primary reasons for the massive devastation caused by Tropical Storm Sendong were the extensive forest denudation and destruction of the Mt. Kitanglad and Mt. Kalatungan watershed areas, and the encroachment of vast agribusiness plantations and unabated mining and quarrying operations in Bukidnon, located above the cities of Cagayan de Oro and Iligan. Sr. Matutina, Morales and Guaynon are part of more than 70 indigenous peoples’ leaders, environment advocates, and victims and relatives of mining-related human rights violations, which compose the delegation of Manilakbayan, a Mindanao peoples’ mobilization in Metro Manila. The mobilization calls for the stop of large-scale mining and the killing of large-scale mining oppositionists including indigenous peoples. Thirty five persons in Mindanao, most of whom are leaders of indigenous communities, have been killed due to their resistance to large-scale mining operations. The Manilakbayan will culminate on December 10 to mark the commemoration of the International Human Rights Day. MANILA – "No one else is to blame but President Noynoy and large scale mining corporations on the lives lost to typhoon Pablo," said Sr. Stella Matutina, secretary general of PANALIPDAN-Mindanao, a network of environmental defenders, in response to National Disaster Risk Reduction and Management Committee (NDRRMC) Usec. Benito Ramos' statement that the typhoon Pablo tragedy is due to illegal mining. PANALIPDAN-Mindanao, together with the KALUMARAN, spearhead the Manilakbayan, the Mindanao people’s journey in Manila to call the government’s attention to the disastrous effects of large-scale destructive mining in Mindanao communities, including extrajudicial killings of environmental advocates and indigenous peoples. "Stop blaming the people of Mindanao for not leaving their disaster-stricken homes and the small-scale miners for doing such a living," Sr. Matutina said. "Small scale mining has been sustainable since the time of the Lumad forefathers. It is not like when large scale mining came in to our towns, destroy our ancestral lands – that's when disasters start coming upon us," Sr. Matutina said. "This typhoon would not have been this tragic if not for the logging and foreign mining companies ravaging our mineral resources," Sr. Matutina continued. "Take note, these foreign companies are declared legal by Noynoy Aquino," Sr. Matutina stressed. The Aquino government has continued and strengthened the Mining Act of 1995 through the Executive Order 79 which opens the Philippines for foreign mining explorations and business. "We are here in Manila to let every Filipino know, especially the Aquino government, that the peoples of Mindanao have suffered enough! Foreign large-scale mining has to stop now," Matutina said. "Our leaders had been killed by the AFP and the paramilitary groups because of their opposition to foreign mining companies. Typhoon Pablo’s disastrous effects on our people and communities only highlight our vulnerability because of these government-favored corporations. And now, the Noynoy government is blaming the Mindanawons for being stubborn to evacuate," Matutina said. "EVACUATE?" the nun repeated the word. "We have already evacuated long before the typhoon came in," Sr. Stella said. She said indigenous peoples had long left their ancestral lands due to severe military operations and military harassments in their communities. "Unless foreign large-scale extractive mining and other business interests will be stopped, we fear that Mindanao will soon be divided into three: one, foreign companies' land; two, evacuation centers of both people from disaster stricken areas and those affected by military operations; and three, cemetery." Sr. Matutina said. Sr. Stella Matutina and 70 other indigenous peoples, tribal leaders and victims of human rights violations are here in Manila for series of activities to call to stop foreign large scale destructive mining and agribusiness plantations in Mindanao. "Manilakbayan" culminates on the International Human Rights Day, December 10. Due to the destruction of super typhoon Pablo that cost the lives of their brothers and sisters, Manilakbayan will also launch its campaign to gather relief goods for Mindanao typhoon victims while they are in Manila. CAMP RUPERTO K. KANGLEON, Palo, Leyte – The Police Regional Office 8 scored the biggest drug haul this year as a recent anti-illegal drugs operation in Kananga town in Leyte yielded a sizeable amount of methamphetamine hydrochloride, popularly known as “shabu”. Police Chief Superintendent Elmer Ragadio Soria, Eastern Visayas police director, informed that joint operatives of Anti-illegal Drugs Special Operations Task Group (AIDSOTG) of Leyte Police Provincial Office, Kananga Police Station and agents from the Philippine Drug Enforcement Agency conducted a sting operation and implementation of search warrant against Roel Olevirio, also known as “Kawi” in his lair at Bantiller St, Poblacion, Kananga, Leyte. “The confiscation and arrest of the suspect was a product of weeks of surveillance on the activities of ‘Kawi’”, the region’s top police official said. Before the buy-bust operation, police lured the suspect into entering a drug deal with their poseur-buyer. This gave authorities the opportunity to set up the buy-bust operation. “An undercover agent acted as poseur-buyer and was able to purchase P500.00 worth of shabu from Kawi,” Soria informed. Once the suspect took their bait, police team led by Police Chief Inspector Santi Noel Matira who were positioned nearby immediately collared the suspect and recovered the P500.00 bill bearing serial number QX923533 used as marked money. Subsequent implementation of search warrant at the suspect’s residence resulted to the confiscation of 5 big sachet of suspected shabu contained in transparent cellophane with a total street value of P700,000.00 and 3 medium sachet of suspected shabu contained in transparent cellophane with an estimated street value of P20,000.00 and assorted illegal drug paraphernalia. The inventory of seized items, photographs, markings of the respective evidences were witnessed by the representative from media and the barangay officials of Poblacion, Kananga, Leyte. The suspect was brought to PDEA for documentation and subsequently detained at Palo Police Station as cases for violation of sections 5, 11 and 12 Article II of RA 9165 or the Comprehensive Drugs Act of 2002 are being readied by the arresting team. Meanwhile, the confiscated illegal drugs and marked money were turned-over to Regional Crime Laboratory for physical examination. The PRO8 chief lauded the PNP personnel involved in the operation. “The arrest of the suspect has prevented the proliferations of illegal drugs in the streets of Kananga town and Leyte province,” Soria said. 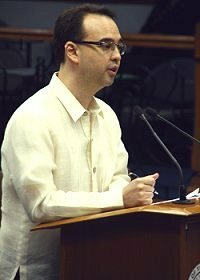 PASAY CITY – Senate minority leader Alan Peter Cayetano called on the government to enact the Freedom of Information (FOI) in order to help President Aquino curb graft and corruption in the country. He made the appeal in his sponsorship speech for Senate Bill 3208 last Tuesday. He said the FOI would help remove the power of government information from a few and give it to the public and help eliminating monopolies in the market, anomalies in the construction of infrastructure, and other similar activities that take away the ordinary Filipino’s ability to earn his living. “By enacting the Freedom of Information Act, we help empower our people to find the solution to these problems and to finally create the change that will make a difference in their lives. It provides the mechanism to disperse power among the people. As such, each and every Filipino can become a graft buster,” he said. The senator stressed that in a time when PiTiK – Mataas na Presyo, Kawalan o Kakulangan ng Trabaho at Kulang o Maliit na Kita – is plaguing our country, the FOI is needed more than ever. “We have been paying a high price for the absence of the FOI bill. In fact, a World Bank study is much quoted has having found that for everyone peso that the government collects, 40 centavos goes to corruption. Also, the Department of Finance and Annual pegged its tax leakage P240 billion. That’s money lost instead of used to help uplift the lives of Filipinos,” he said. He explained that in a time when information is power, it becomes the government’s responsibility to empower its citizenry and enable them to take an active part in fortifying this country’s defenses against graft and corruption through the passage of the FOI bill. “Democracy is all about people making decisions. Through the enactment of the FOI bill, every Filipino can be true partners of the government in establishing a system that is truly clean, bent to serve and is accountable to the public it serves,” he said. While Cayetano expressed his belief in the President’s vision of “tuwid na daan”, he stressed that without an FOI bill in place the country has no concrete means to exact accountability from the government. “An open, accountable and transparent leadership helps regain the trust of the people on their government. We have to build on that trust, Mr. President. Let’s certify this as urgent and push for the passage of the FOI bill now,” he said. MANILA – Vice President Jejomar C. Binay today asked the Chinese government to officially clarify a supposed order for Chinese authorities to board foreign vessels in the West Philippine Sea, calling it a possible curtailment of maritime navigation. He also backed a move by the government not to stamp visas on new Chinese passports which show islands in the disputed area as part of China. “Our President has asked for an explanation. What does this policy of boarding and inspecting all ships in the area really mean? It appears to be contrary to the concept of free maritime navigation,” he said. He also defended the decision not to stamp visas on the new Chinese passports, as this would be equivalent to recognizing China’s claim on the islands included in the map reprinted on the passport. “We are not stamping our visas on these passports because that would be tantamount to recognizing their claim,” he said, adding that other countries who are claimants to the area have also done the same. China recently issued new electronic passports bearing a map that outlines its supposed territories in the West Philippine Sea through the so-called nine-dash line, a U-shaped map that covers nearly 90 percent of the waters and overlaps with the sovereign territories of its Southeast Asian neighbors including the Philippines, Vietnam, Malaysia and Brunei. The new law enacted by Hainan province, meanwhile, will enable Chinese authorities to board, inspect, detain, confiscate, immobilize and expel, foreigners who will be caught sailing through their supposed territory. Waters in the jurisdiction of Hainan province is being claimed by China, including virtually the entire West Philippine Sea under the nine-dash line. The Hainan law is supposed to take effect in January 2013. BORONGAN CITY – Eastern Samar Governor Conrado B. Nicart, Jr., addressed employees of the provincial government on December 3, 2012 after their flag-raising ceremony, putting an end to rumors of his death due to a heart attack. Gov. 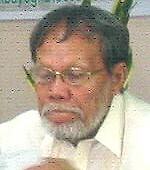 Conrado B. Nicart, Jr. According to Nicart, he was alarmed when he received a phone call on Friday from Department of Interior and Local Government-VIII Regional Director Pedro Noval, Jr., the latter asking about the state of his health. “Dir. Noval told me someone called him up to notify him of my death,” Nicart said. The rumor was also reported to have circulated through social networking sites and spread like wildfire during the weekend through text messaging. Explaining his absence, Nicart said he was in Metro Manila to take care of some business so that he was not seen in the provincial capitol for a couple of days. “While I was at the national capital, I also went through a medical checkup and was advised to see a physical therapist regarding my shoulder problem,” Nicart said. Provincial Legal Officer Atty. Christopher Coles, in a separate interview, clarified that despite the governor’s physical absence there was no truth to news that the provincial government was “paralyzed” for a few weeks. “As for transactions, it was business as usual,” Coles said. After a brief interaction with members of the press in his office on December 3, Nicart went back to signing paper works filed on his table.